While these new CPUs do not use a new microarchitecture compared to the first generation Skylake-based Xeon Scalable processors, Intel surprised most of the press at its Tech Day with the sheer number of improvements in other areas of Cascade Lake. Not only are there more hardware mitigations against Spectre and Meltdown than we expected, but we have Optane DC Persistent Memory support. The high-volume processors get a performance boost by having up to 25% extra cores, and every processor gets double the memory support (and faster memory, too). Using the latest manufacturing technologies allows for frequency improvements, which when combined with new AVX-512 modes shows some drastic increases in machine learning performance for those that can use them. New to the Xeon Scalable family is the AP line of processors. Intel gave a hint to these late last year, but we finally got some of the details. 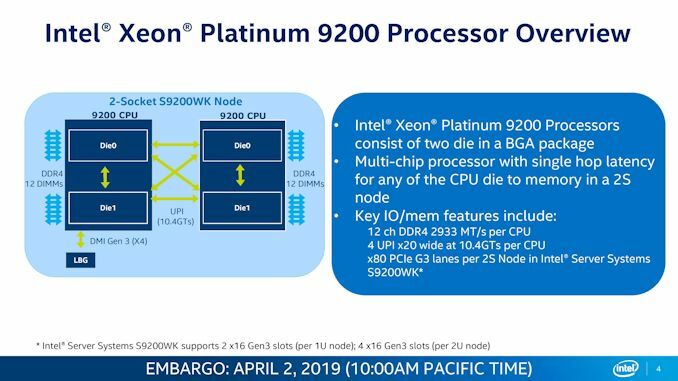 These new Xeon Platinum 9200 family of parts combine two 28-core bits of silicon into a single package, offering up to 56 cores and 112 threads with 12 channels of memory, in a thermal envelope up to 400W. This is essentially a 2P configuration on a single chip, and is designed for high-density deployments. These BGA-only CPUs will only be sold with an underlying Intel-designed platform straight from OEMs, and will not have a direct price – customers will pay for ‘the solution’, rather than the product. Out of all of these, the Speed Select ‘Y’ models are the most interesting. These have additional power monitoring tools that allow for applications to be pinned to certain cores that can boost higher than other cores – distributing the power available to different places on the cores based on what needs to be prioritized. These parts also allow for three different OEM-specified base and turbo frequency settings, so that one system can be focused of three different types of workloads. Cascade Lake, Now with Up To 56-Cores and Optane! The other key element to the processors is the Optane support, discussed next. If you’re confused about Optane, you are not the only one. 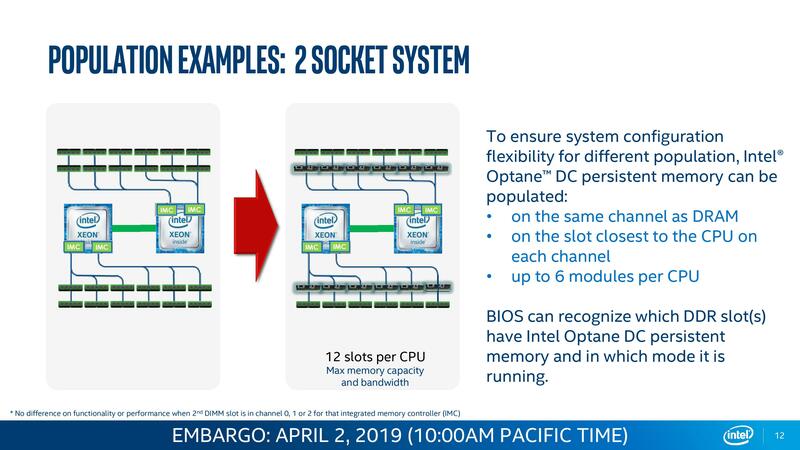 Broadly speaking, Intel has two different types of Optane: Optane Storage, and Optane DIMMs. The storage products have already been in the market for some time, both in consumer and enterprise, showing exceptional random access latency above and beyond anything NAND can provide, albeit for a price. For users that can amortize the cost, it makes for a great product for that market. 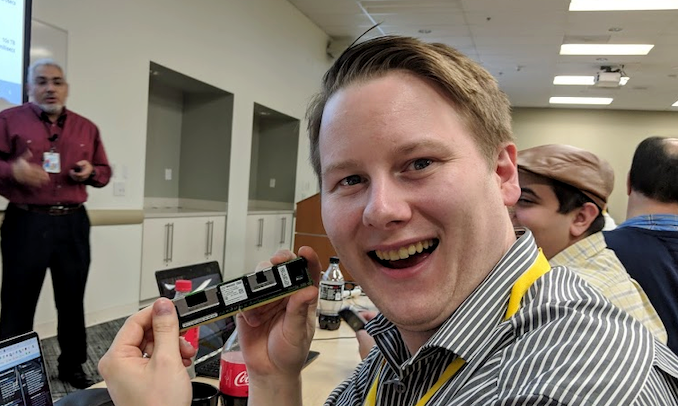 Optane in the memory module form factor actually works on the DDR4-T standard. The product is focused for the Enterprise market, and while Intel has talked about ‘Optane DIMMs’ for a while, today is the ‘official launch’. Select customers are already testing and using it, while general availability is due in the next couple of months. With Optane DCPMM in a system, it can be used in two modes: Memory Mode and App Direct. The first mode is the simplest mode to think about it: as DRAM. The system will see the large DRAM allocation, but in reality it will use the Optane DCPMM as the main memory store and the DDR4 as a buffer to it. If the buffer contains the data needed straight away, it makes for a standard DRAM fast read/write, while if it is in the Optane, it is slightly slower. How this is negotiated is between the DDR4 controller and the Optane DCPMM controller on the module, but this ultimately works great for large DRAM installations, rather than keeping everything in slower NVMe. One of the issues, when Optane was first announced, was if it would support enough read/write cycles to act as DRAM, given that the same technology was also being used for storage. To alleviate fears, Intel is going to guarantee every Optane module for 3 years, even if that module is run at peak writes for the entire warranty period. Not only does this mean Intel is placing its faith and honor into its own product, it even convinced the very skeptical Charlie from SemiAccurate, who has been a long-time critic of the technology (mostly due to the lack of pre-launch information, but he seems satisfied for now). Pricing for Intel’s Optane DCPMM is undisclosed at this point. The official line is that there is no specific MSRP for the different sized modules – it is likely to depend on which customers end up buying into the platform, how much, what level of support, and how Intel might interact with them to optimize the setup. We’re likely to see cloud providers offer instances backed with Optane DCPMM, and OEMs like Dell say they have systems planned for general availability in June. Dell stated that they expect users who can take advantage of the large memory mode to start using it first, with those who might be able to accelerate a workflow with App Direct mode taking some time to rewrite their software. It should be noted that not all of Intel's second generation Xeon Scalable CPUs support Optane. Only Xeon Platinum 8200 family, Xeon Gold 6200 family, Xeon Gold 5200 family, and the Xeon Silver 4215 does. The Xeon Platinum 9200 family do not. Intel has given us remote access into a couple of systems with Optane DCPMM installed. We’re still going through the process of finding the best way to benchmark the hardware, so stay tuned for that. The acquisition of Altera a couple of years ago was big news for Intel. The idea was to introduce FPGAs into Intel’s product family and eventually realize a number of synergies between the two, integrating the portfolio while also aiming to take advantage of Intel’s manufacturing facilities and corporate sales channels. Despite that happening in 2015, every product since was developed prior to that acquisition, prior to the integration of the two companies – until today. 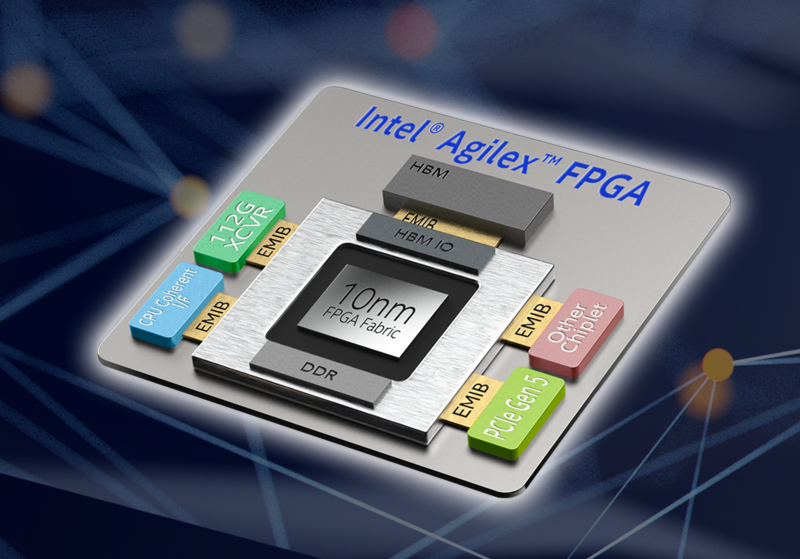 The new Agilex family of FPGAs is the first developed and produced wholly under the Intel name. The announcement for Agilex is today, however the first 10nm samples will be available in Q3. The role of the FPGA has been evolving of late, from offering a general purpose spatial compute hardware to offering hardened accelerators and enabling new technologies. With Agilex, Intel aims to offer that mix of acceleration and configuration, not only with the core array of gates, but also by virtue of additional chiplet extensions enabled through Intel’s Embedded Multi-Die Interconnect Bridge (EMIB) technology. These chiplets can be custom third-party IP, PCIe 5.0, HBM, 112G transceivers, or even Intel’s new Compute eXpress Link cache coherent architecture. Intel is promoting up to 40 TFLOPs of DSP performance, and is promoting its use in mixed precision machine learning, with hardened support for bfloat16 and INT2 to INT8. Intel will be launching Agilex in three product families: F, I, and M, in that order of both time and complexity. The Intel Quartus Prime software to program these devices will be updated for support during April, but the first F models will be available in Q3. Intel currently offers a lot of 10 gigabit Ethernet and 25 gigabit Ethernet infrastructure in the data center. The company launched 100G Omnipath a few years ago as an early alternative, and is looking towards a second generation of Omnipath to double that speed. 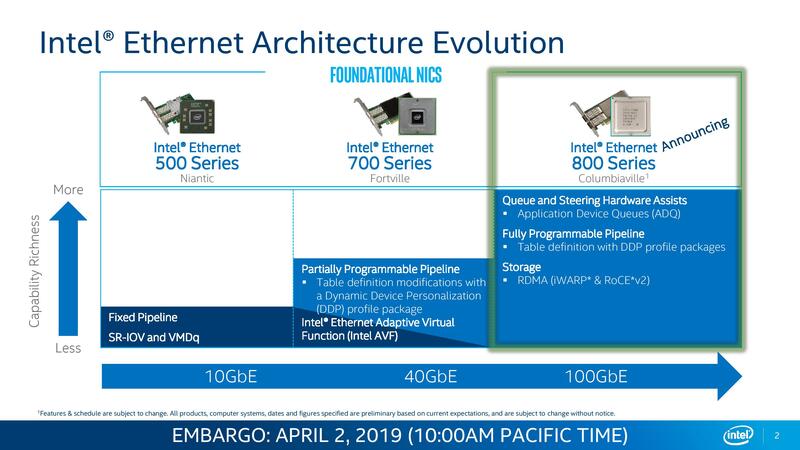 In the meantime Intel has developed and is going to launch Columbiaville, its controller offering for the 100G Ethernet market, labeled as the Intel 800-Series. 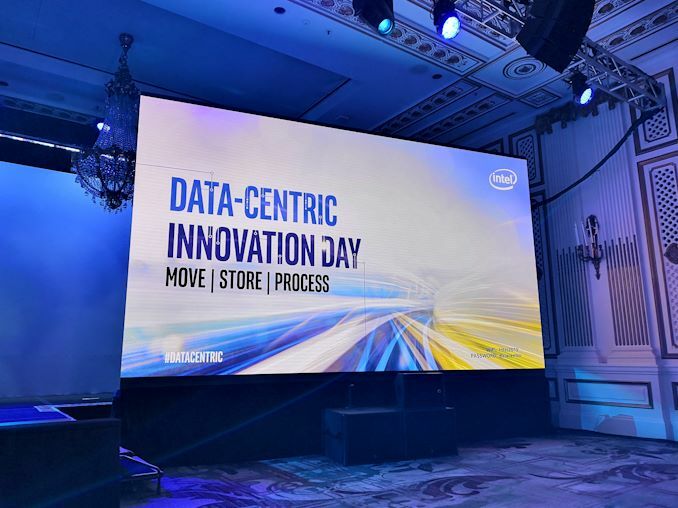 Introducing faster networking to the data center infrastructure is certainly a positive, however Intel is keen to promote a few new technologies with the product. Application Design Queues (ADQs) are in place to help hardware accelerate priority packets to ensure consistent performance, while Dynamic Device Personalization (DDP) enables additional programming functionality within packet sending for unique networking setups to allow for additional functionality and/or security. The dual-port 100G card will be called the E810-CQDA2, and we’re still waiting information about the chip: die size, cost, process, etc. Intel states that its 100 GbE offerings will be available in Q3. One of Intel’s key product areas is the edge, both in terms of compute and networking. 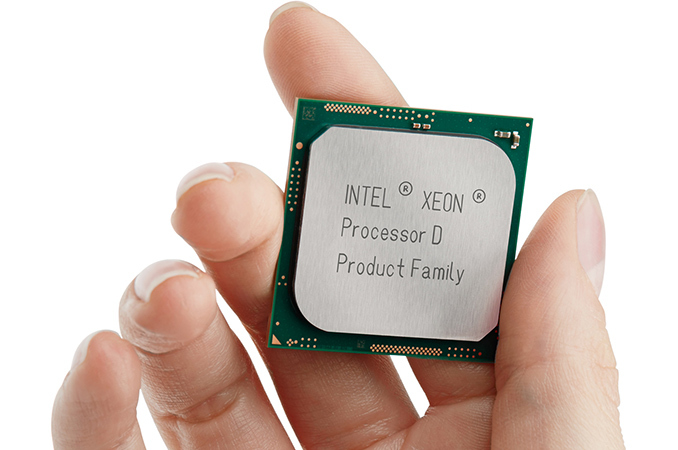 One of the products that Intel has focused on this area is Xeon D, which covers either the high efficiency compute with accelerated networking and cryptography (D-1500) and the high throughput compute with accelerated networking and cryptography (D-2100). The former being Broadwell well based and the latter is Skylake based. 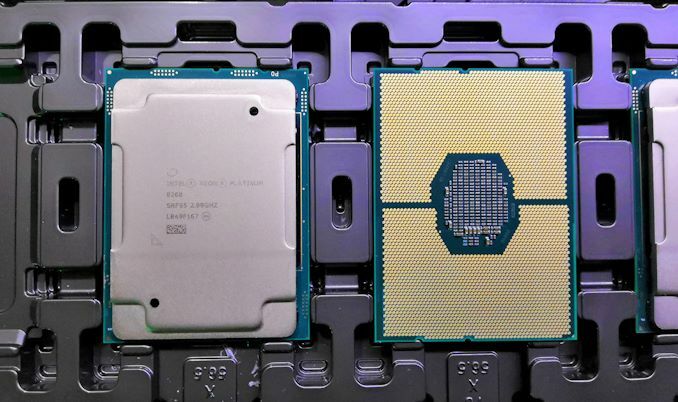 Intel’s new Xeon D-1600 is a direct D-1500 successor: a true single-die solution taking advantage of an additional frequency and efficiency bump in the manufacturing process. It is still built on the same manufacturing process as D-1500, allowing Intel’s partners to easily drop in the new version without many functional changes. I think the news of Intel Agilex FPGA is significant. I wonder if this chip is planned to be use in new Cray Supercomputers. 3. dual socket 8 core cpus. The 10nm is likely from Custom Foundry, i.e Not the same 10nm used in Icelake. From other articles about the 56-core 9200, it sounds like it essentially is a dual-socket-in-one-mount solution. It's also BGA-only. It's designed for ultra-high-density servers (blade servers, etc,) to have the effective nature of dual-socket in far less physical space. It's 12 memory channels per socket, compared to 6 per socket for the 8200-series, so it's almost certainly just two 8200-series dies in one package. It's also nearly double the wattage. And it can have a two-package solution (I would say "two socket," but it's soldered not socketed,) to have a four-socket-equivalent system in less space than a two-socket system. 2. serdes is still 16/20 nm so it will have same feature level as competitors. 4. 40 in bfloat16. In regular 32b IEEE 754 it is just 10 TFLOPs!!! This is what they originaly advertised for Stratix 10. Btw. : FPGA is pretty small. Only 30% more elements compared to Stratix 10. Where is claimed 2,7x better density? 40% performance gain is based on estimates in highest speed grade compared to Stratix 10 in -2 without mentioned voltage. Point is that these settings can cause double digit performance difference by itself. This is shame. It is probably worst FPGA in Alteras history. @Ian Cutress : I am really looking forward to see Storage Class Memory (SCM) like 3D X-Point being used on the memory bus of consumer laptop computers and smartphones, and that it could be used as a bootable RAMDisk : in theory, it should help lower latency of several order of magnitude and bring some noticeable responsiveness improvements a bit like replacing a Hard Disk Drive (HDD) by a Solid State Drive (SSD) did. I know it is hard to predict the future, but approximatively what year do you think it would begin to be possible for consumers to buy a laptop / smartphone with 256GB or more of SCM plugged on a memory bus channel ? There have already been laptops with configurations like 4 GB RAM + 16 GB 3D XPoint. I don't know if the XPoint is on the memory bus, but even that small amount should be enough to hold the OS and some applications. I don't know if describing XPoint as "slightly slower" than DRAM is accurate. That seems like Intel marketing speak. Certainly, there is room for another post-NAND technology to improve beyond XPoint and the bridge the gap between memory and storage. Although the NVMe protocol is faster than the SATA protocal, from what I read on different websites, is that it still add much more latency than the same SCM plugged on the memory bus.